The game that won’t go away is back, this time with all kinds of shiny gizmos and a brand new artist! Most gamers are familiar with Munchkin at this point – a humorous and light-hearted riff on role-players who focus on building juggernauts over having fun, consisting of 100 or so cards and needing an hour to get through. With themed sets such as Steampunk (which don’t offer changes to gameplay) it’s really about your genre preferences. But this one offers a jarring change – it’s not illustrated by John Kovalic! Is that even allowed? Munchkin can be surprisingly deep – and it’s mostly surprising because of the simple component list and ease of set-up. In Munchkin-speak, “Deluxe” simply means it comes with a board and pawns to track player levels. Munchkin Steampunk Deluxe is the standard (and only) version of Munchkin Steampunk, meaning set-up starts with laying out a board before you shuffle two decks of cards and deal starting hands. Still super easy. Munchkin‘s two decks of cards are called the Door deck and the Treasure deck. On a player’s turn they will reveal the top card of the Door deck and learn their fate – possibly fighting a monster, possibly becoming cursed, and occasionally finding something useful. The Treasure deck provides the spoils from slaying monsters. To kick off a game of Munchkin each player receives 4 cards from each deck. Yes, this may mean you hold a powerful monster or two in your hand – and you’ll be allowed to deploy them to your advantage (or your opponent’s detriment) later. While each turn begins by revealing the top card of the Door deck, players have a few options on how to proceed depending on the revealed card. If a monster was revealed you may be able to defeat it on your own. The victor in a battle is simply determined by comparing the monster’s level to your level plus the bonuses granted by any equiped items or one-shots you wish to use. Monsters in Munchkin Steampunk have levels ranging from 1 to 20, but your opponents will have an opportunity to make them stronger by playing certain cards. The highest your level can go is 10, so you’ll need some heavy equipment to tackle the biggest monsters. If you win the battle you go up one or two levels depending on the monster’s difficulty. Reaching level 10 is Munchkin‘s victory condition. If you can’t defeat a monster on your own you may ask a fellow player for assistance. You’ll need to barter your cards to get that assistance, as only you – not the assisting player – will receive the level benefit from beating the monster. This last option makes holding monsters in your hand extremely powerful. You can develop a good idea of what cards your opponents hold that may be used to enhance a monster you’re fighting and wait to deploy that monster until you think you’ve got enough buffer to beat them under any circumstance. And while there are ways to level up other than defeating monsters (such as “Go Up a Level” cards found in the Treasure deck or selling 1,000 points worth of items for a level (most Treasure items have a value listed on them)), you can only move to level 10 – and win the game – by beating a monster. Holding a level 1 monster late in the game can be the closest thing to a “safe” route to victory in Munchkin. Surprisingly, Munchkin plays beautifully without the “take that” stuff it’s become known for. The humor isn’t too adult (although most “jokes” may go over the head of pre-teens), and the gameplay is easy to comprehend. Or the “take that” stuff can be emphasized! There are plenty of ways to mess with a player’s plans… and it’s just plain fun to throw an unbeatable monster into the fray of a battle your opponent thought would be a cake-walk! All of the cards residing in two decks makes everything random, and your opponents will get in your way when you least expect it. An affinity for the source material or genre (whether it’s RPGs, steampunk, or any of the other dozen-plus themes available) helps, but there are plenty of jokes in each set that anybody can get. Really easy to teach anyone – gamer or no – how to play Munchkin, and it can be played nearly anywhere by taking the cards and die along while leaving the board and pawns at home. So many versions of Munchkin, and so many expansions available for those versions… and they’re all cross-compatible. You could spend years trying out different combinations and refining it to your preferences. 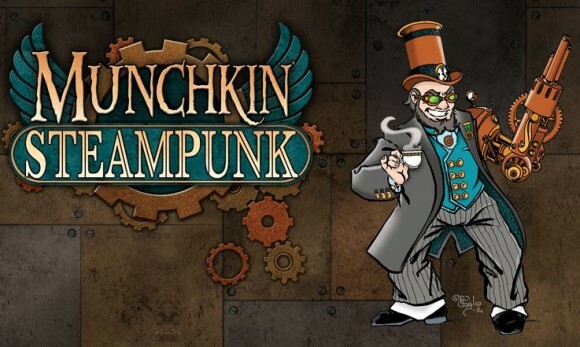 So what’s different about Munchkin Steampunk Deluxe from every other version? The art. Illustrated here by Phil Foglio, this version looks decidedly different from the others. Fortunately it possesses the same illustrated comedy that endears Munchkin to its legion of followers. While the game itself has its detractors – possibly owing to its on-the-nose lightheartedness (all Munchkin rulebooks contain several instances of intentional vaguery and statements like “in a rules dispute, the game’s owner decides” or “argue about it until there’s a resolution”) – Munchkin stands the test of time as an absolute first-rate gateway card game. There’s depth aplenty, particularly by mixing and matching from the nearly unmatched number of expansions available. The fact that Steve Jackson Games has been able to keep Munchkin fresh for 15 years without expansions that alter rules or gameplay (although there are a few of those as well) is remarkable, and ultimately a testament to the tight design and seamless incorporation of humor. Munchkin Steampunk Deluxe comes with a board and standees for tracking your level, and is illustrated by Phil Foglio! This game is a good addition to the Munchkin Universe (family of games) and has as usual for Steve Jackson great humor. The Biggest draw to this game is that Phil Foglio is the artist. I have met him and am a big fan of his art style. This game is a great outlet for his art style and a great game too. If you love Munchkin this is a good addition to your game library. 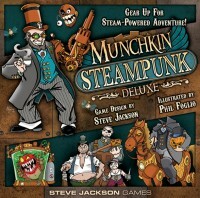 Add a Review for "Munchkin Steampunk Deluxe"